Copper plated freeflow pourer. Finished in a copper plating the perfect way to add a vintage touch to your bottles of spirits, and are sure to give your bar a unique look. 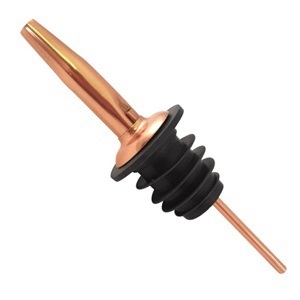 As well as adding a touch of the unique to any bar, these pourers are also the perfect way of reducing spills and mess. Fitting in nearly any liquor bottle, these freeflow pourers can also be used to help create layered drinks for ultimate style. Rubber cork fits most bottles. Stainless steel with a copper plating.